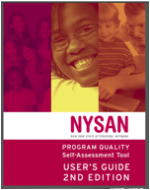 While the Network for Youth Success’ Third Edition of the Quality Self- Assessment Tool (QSA) has recently been released, the Network realizes that some programs and organizations may still be using the Second Edition. Therefore, the QSA Second Edition and all of its related tools can still be found on this page. The QSA Tool is meant to be used in concert with other formal and informal evaluation methods, such as youth, parent, and staff meetings, youth and parent focus groups, and external monitoring and evaluation. Each of these methods can help identify program strengths and areas in need of improvement. For more information on how the QSA Tool compares to other leading assessment instruments, see Measuring Youth Program Quality: A Guide to Assessment Tools published by the Forum for Youth Investment. Full tool element performance level indicators. Find a full list of performance indicator definitions here. The QSA Tool can appear daunting at first glance, but it is called a “tool” because it is meant to help your organization grow, and it is designed to be tailored according to your needs. Watch the following introductory webinar to get a better understanding of the QSA Tool and different ways that you can use it to improve your program. STEP 1: Begin by determining who will lead and facilitate the self-assessment process. A committed leader is one of the most important factors for a successful self-assessment process. In collaboration with other staff and stakeholders, the self-assessment leader needs to determine who will be engaged in the process, how and when it will take place, who will facilitate discussions, how data and findings will be compiled and shared, and help ensure the self-assessment process leads to planning and program improvement. The self-assessment leader may find this QSA Planning Tool and this Sample QSA Calendar for 2017-18 useful in preparing for self-assessment. The self-assessment leader may also facilitate discussions, though this role may be taken by another person as well. Often, site directors or supervisors take the lead in ensuring the organization undertakes the self-assessment process. However, staff, school personnel, volunteers, and parents can also possess the qualities needed to serve as a facilitator. In some cases, programs choose to engage an external facilitator to assist in leading the process and offering a neutral voice in discussions. The process requires a facilitator who possesses several key characteristics in order to be successful in engaging all stakeholders and creating an atmosphere that is safe, comfortable, and empowering. More on Facilitating the Process. STEP 2: Determine who will be involved in the self-assessment process. It is very important to involve a variety of stakeholders when using the QSA Tool, whether you are a new program in the planning stages or a mature program striving for ongoing improvement. Site directors, staff members, program participants, parents, school administrators, partner organizations, funders, and other stakeholders can all be an important part of the process. It is important to consider the aspects of the program that you plan to self-assess when selecting participants. For example, while program participants have strong knowledge of program activities, youth engagement, etc., they may not be appropriate stakeholders to involve in discussions about staffing and professional development or program growth and sustainability. More on Stakeholder Engagement Strategies. STEP 3: Determine when to conduct the self-assessment. There is no perfect time to conduct a self-assessment. You may choose to introduce the self-assessment process prior to program start-up in order to strengthen relationships and begin building consensus around vision and program goals. However, engaging in the self-assessment process in the middle of the year can be useful because it provides a means for stepping back and identifying what’s working and what may need to change. You may also do a self-assessment at the end of the year as a way of identifying areas of expansion or improvement for the following year. Or, you may choose to conduct a self-assessment at all of these times. The self-assessment process can be conducted in one day or over the course of a whole year. You can focus on one element a month throughout a program year, or choose specific elements to focus on with particular groups of stakeholders. Regardless of when it is done, the timing needs to compliment what is happening at your site. Focus on one element per month and have a different staff member lead each element during a staff meeting as part of their professional development. Start by self-assessing an element that you think the program is doing well on. This will help the team get the feel for self-assessment before tackling the more difficult elements for improvement. STEP 4: Gather stakeholder feedback. Once you have determined your self-assessment leader, facilitator, stakeholders, timing, and focus-area, you must begin the process of gathering feedback from stakeholders. You may do this by surveying stakeholders using the actual QSA Tool survey for your focus element along with the performance level examples, using surveys for youth or parents based on the QSA Tool, through a large focus group discussion with multiple stakeholders, or through multiple small focus group discussions with different sets of stakeholders. As you are gathering feedback, these Survey and Compilation Spreadsheets may be useful in collecting and analyzing data. More on Hosting Focus Groups. Right Now: Area will be addressed prior to or at the start of program. This Year: Area will be addressed during the program year. Next Year: Area will be re-evaluated prior to the start of the next program year. This planning process can help you generate a variety of ideas for how to improve your program and identify opportunities for growth. Developing a manageable action plan that is realistic and specific is a key factor to ensuring your team’s success. The action plan helps keep your team on track by identifying the steps you should take to achieve program goals and the timeframe in which they will be completed. Be sure to designate a person responsible for each step and to check in periodically. The plan serves as your roadmap as you are taking steps to improve and enhance the quality of your program. Click to download an Action Plan and Improvement Plan Template with Instructions. Use in conjunction with this SMART Goals Template to create well-crafted plans for improvement. Determine your goals for the year. Discuss and prioritize specific quality indicators related to your goals. Decide who will take the lead. Identify financial, technical, and human resources needed to achieve your goals. Brainstorm specific next steps to achieve your goals. Part of your action plan may include increased professional development for staff. Use the Partnership for After School Education’s Professional Development Planning Tool to determine the best plan for each staff member and the team as a whole. Implement the action plan. Each person listed as responsible for an action should work on their part of the action plan. The self-assessment leader should check in with the responsible staff at pre-determined check in points listed on the action plan to find out how progress is going and if anyone needs assistance in implementing their part of the plan. Re-assess the program using the QSA Tool and the stakeholders used for the original self-assessment if possible. Taking another look at the program after the action plan has been completed gives the program an idea of whether the improvements have been made and are working as planned, or whether some adjustments need to be made and an updated action plan should be created to take into consideration any new knowledge or challenges that have arisen. Use results from the re-assessment to determine changes to the action plan. Focus on those areas where improvements have not been made or the intended results have not been achieved. As a group, determine the steps necessary to make the improvements. Be sure to complete the entire action plan, including persons responsible for each step and deadlines. Once you have completed the updated action plan, re-assess the program using the process outlined above in Step D, again preferably using the QSA Tool and the original stakeholders involved. If it is determined that additional improvements need to be made, return to Step E.
If all improvements have been made as intended and the group determines that no additional improvements need to be made in the focus area at the time, you may move back to the beginning of the process and select another focus area. It is important to continue any new processes and strategies from your action plan, however, so that quality is maintained. Periodically check back by re-assessing any and all areas which you have focused on. If it is determined that quality has not been maintained, enter back into the improvement process and create a new action plan.